Fans of chiptune and video game music in general have a whole bunch of freshly released tracks to enjoy thanks to Capcom dropping a boatload of albums on Spotify. They range from the classic NES Mega Man through PS1-era Resident Evil, Monster Hunter, Phoenix Wright, Devil May Cry, E.X. Troopers - the list goes on. First noticed by Twitter user @_watsu, it's a sizeable drop. More than enough to be getting on with, it's great to see Capcom making these albums more widely available, especially considering how pricey OSTs can get. If your Japanese isn't up to scratch, you'll have to scrutinise the album art or, alternatively, just hit shuffle - you can't go too far wrong. See any personal favourites on the list? Anything you'd like to see Capcom add? Discuss your faves below. Yay exciting! The more game music on streaming services, the better. Sincerely wish Nintendo and Konami and other publishers would follow suit. Beautiful... time to listen to all that Street Fighter music! Great news! Video game music has always been difficult to find in Spotify, and these are classics. Woah. that's awesome! Other developers take note, please! Culminating in this, I guess. I was upset there's no street fighter alpha 2. They changed all the music in alpha 3 and it just isn't as good. Considering the last huge dump we got from Capcom was Resident Evil Survivor*, I'm ecstatic with this news! *Actually quite enjoyed it, but needed something there for the purposes of the pun. Bit of a longshot, but anything from The Minish Cap on there? Yes! Ace Attorney’s soundtrack is absolutely phenomenal. Now I can listen to Judgement (from ace attorney, or at least I think thats what its called), and Gullies theme! Noice. I use Spotify during my work day. Will give these a spin. Awesome. I'll add some Ace Attorney and Mega Man music for starters. I really hoped there would be Ghost Trick music too. Maybe they'll add more later. Great, now if I get into an argument with someone I can just tell their smart home device to play Objection 2001 during it! Thank god they put all of this back on. All the capcom stuff was unceremoniously deleted from Spotify months ago. Glad to see its back with a vengeance. I see Gyakutan Saiban music and I'm now interested in Spotify for the first time. Maybe I'll look at the price of a subscription or whatever soon. 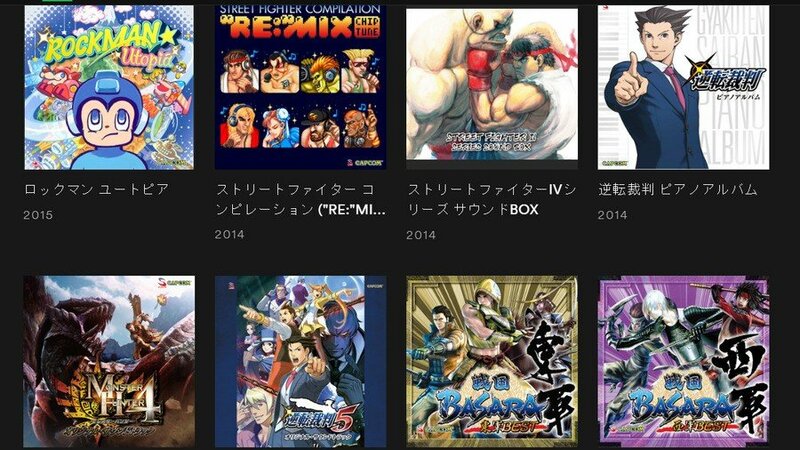 Apple Music needs some Capcom love! Now my entire life can be accented by mood music. Wait my boss is coming "cue dark melody"
It's a bummer for those of us in the U.S. though, where certain albums like MHW and AA3 are completely locked and unavailable.